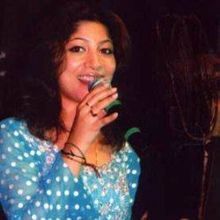 Raktima Mukherjee, born in RANIGANJ, West Bengal, started learning music at an early age of 3 from mother Rupali Mukherjee when father was posted in A.I.R. Agartala in Tripura. Learned Manipuri and Katthak form of dance in Tripura Rabindra Bhavan, continued with both the art forms and won many State and National level Competitions while studying in Kendriya Vidyalaya. Fully opted for music later, apart from mother and maternal aunts learned music from Shri Ardhendu Adhikari of Ranigang, In Kolkata, started learning all forms of Bengali light music and Ghazal and Bhajan from Smt.Anushuaa Mukherjee. 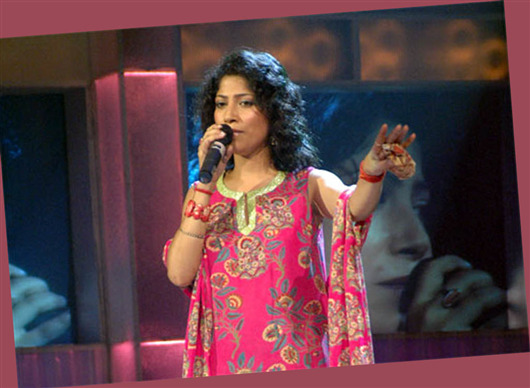 In 1996 participated and won the first T.V.Musical show of Zee Bangla called ZEE JALSHA , 1997 participated in All India Radio MUSIC Competitions and Created a Record by Winning 3 prizes In Bhajan, Ghazal and Shyamasangeet . She won Gold Medal in Bhajan,Silver in Ghazal and Shyamasangeet, thus got a direct title of a graded Artist in 3 subjects from ALL INDIA RADIO. 1998-1999-2000 participated in well known RAJYA SANGEET Annual competitions and won consecutively in Bhajan, Ghazal, and Nazrulgeeti in the State...2001 participated in ZEE Bangla SA RE GA MA PA and became a semi finalist. 2000 and 2001, won the prestigious and Famous DOVERLANE Music Competition In Raagpradhan and Bhajan. 2005, participated and Won in ZEE T.V.Fame 2005 series and got a direct Wild Card Entry in HERO HONDA SAREGAMAPA CHALLENGE 2005-2006 representing kolkata Under JAI HO gharana of Adesh Srivastava and became a Finalist, participated in EK MAI AUR EK TU of ZEE T.V. in 2006. 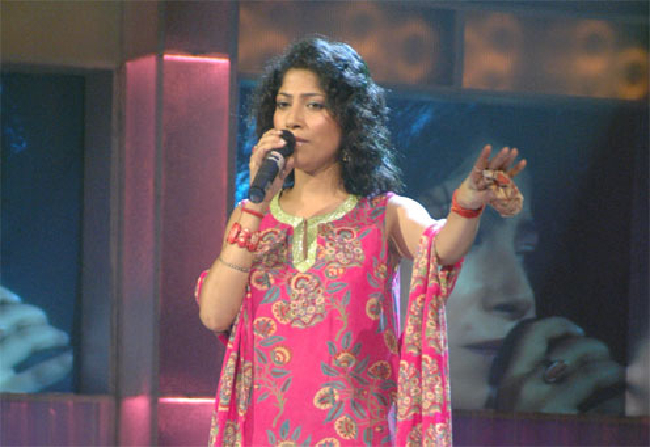 Sang in Rock the Dhun series of Zee in 2007. Started Performing In INDIA and Abroad from 2006 and performed with SHAAN,BAPPI LAHIRI, ABHIJEET BHATTACHARYA, UDIT NARAYAN, ADITYA NARAYAN, JAVED ALI and K.K to name a few in India and Abroad. She did Playback for Hindi, Bengali, Marathi, Bhojpuri, Nepali ,Telegu oriya and many other languages in films, she sang for Disney, Star Plus, Sony, ZEE and Imagine T.V, worked as a singer for Bappi lahiri ,Pritam, Lalit Sen ,Lalit pandit ,Sunil Kaushik, Nitin Shankar , Ismail D,arbar,Sajjad ali . Sang with Roop Kumar Rathod the TITLE for ZEE T.V'S MERA NAAM KAREGI RAUSHAN,...TITLE SONG .Lyf O.K SAPNO k BHANWAR ME 2010 2011,TITLE SONG Imagine T.v BEEND BANUNGA GHODI CHADHUNGA.....2010 Sang For CHOTA BHEEM movie n serial 2011 to 2014.....Sang for the Hindi movie,MR.HOT MR.KOOL in 2007 with Shaan and CHALLO DRIVER with shaan 2013,sang for Hindi Movie "ISHQ KE PARINDEY" & " BESTSELLER" in 2015....Did playback in BENGALI MOVIE SONGS ...TAKKAR ,..COME BACK,...AMAAR BHALOLAGA AMAAR BHALOBASHA,...EI ORRONYE to name a few....!! 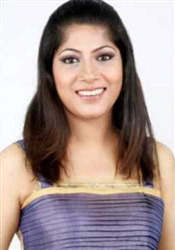 Why Book Raktima Mukherjee Through ArtiseBooking?